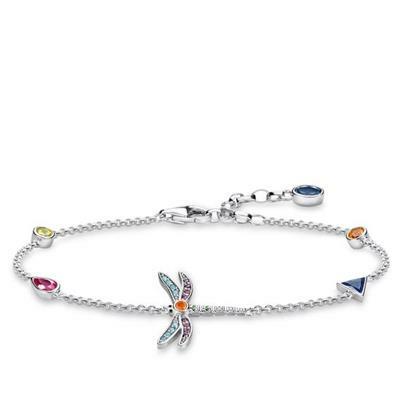 From Thomas Sabo's 'Paradise Colours' collection is this stunning Silver Dragonfly Multistone Bracelet. A perfect bracelet to wear in the Spring/Summer season, with its brightly coloured stones. The Thomas Sabo Silver Dragonfly Multistone Bracelet features a dragonfly charm in the centre of the bracelet, with smaller colourful stones spaced along either side of the bracelet chain. The dragonfly is a symbol of lightness, and this bracelet was designed to represent happiness and freedom. With a mix of colours and shapes, this bracelet has a playful style and boho vibe. This bracelet would be the perfect gift for her. The bracelet is crafted from 925 Sterling Silver. It is embellished with Cubic Zirconia stones to give the bracelet an extra sparkle. It has an adjustable lobster clasp.